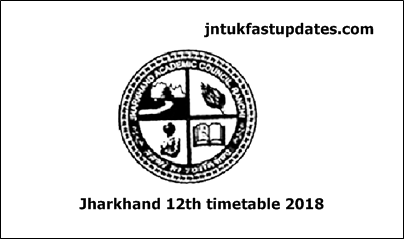 JAC 12th Time Table 2019: Jharkhand Board Intermediate Science, Arts, Commerce Programme/Date Sheet for Higher Secondary Examinations, 2019 are announced by JAC. As per the Time table Jharkand Academic Council (JAC) will be held the Intermediate exams from 20th February, 2019, till 9th March, 2019. Candidates who are interested to prepare well in advance for the exams can download the timetable from the specified below link. Students who are pursuing under jharkhand academic council board will let you know the details of examinations 2019 from the official website after the announcement. Exam Dates: The JAC intermediate exams will begin with Vocational on February 20 and will end with Biology, Geography and Business Mathematics on March 9. Time: The intermediate exam will be conducted in afternoon shifts (2.00 PM – 5.15 PM). 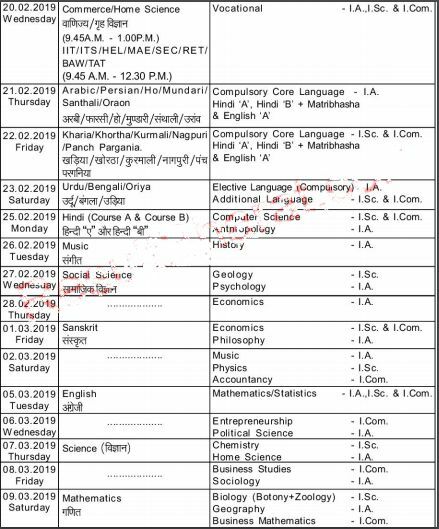 Status JAC Intermediate Time Table 2019 released. Here, We can check the details of Jharkhand board 12th exam date 2019, Jac 12th exam date 2019. Wednesday Vocational – I.A.,I.Sc. & I.Com. Thursday Compulsory Core Language – I.A. Friday Compulsory Core Language – I.Sc. & I.Com. Saturday Elective Language (Compulsory) – I.A. Additional Language – I.Sc. & I.Com. Monday Computer Science – I.Sc. & I.Com. Friday Economics – I.Sc. & I.Com. Tuesday Mathematics/Statistics – I.A.,I.Sc. & I.Com. Friday Business Studies – I.Com. Saturday Biology (Botony+Zoology) – I.Sc. With the establishment of the Jharkhand Academic Council, the Bihar Intermediate Education Council Act, 1992, the Bihar School Examination Board Act, 1952 (adapted as Jharkhand Secondary Examination Board Act, 2000) Bihar Sanskrit Education Board Act, 1981 And Bihar Board of Madrasa Educaiton Board Acts, 1981 were repealed. We would like to greet “ALL THE BEST” to you for your bright future. We are very happy for you being here. Thanking you for visiting our site and reading our post. We ensure that we will update our site with more fine points regularly.In the last year, there is a exceed number of girls than boys who have attended for the Secondary and Higher Secondary Examinations and they scored best grades in the examinations.